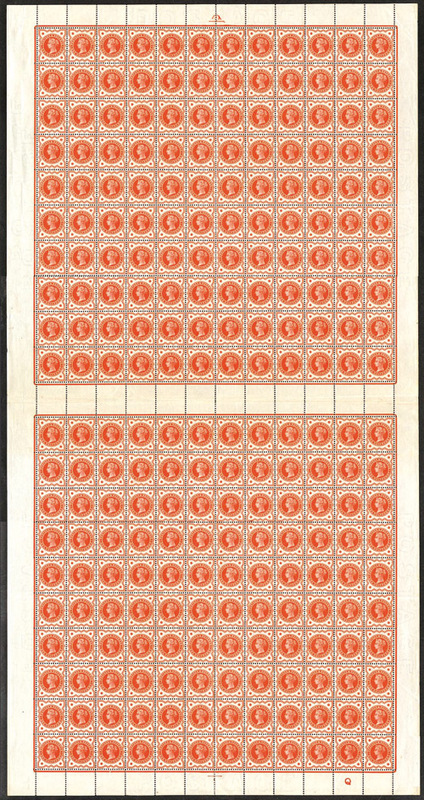 De La Rue used Imperial Crown watermarked paper (fig.1) for the Jubilee issue (as they did for all the surface-printed issues up to 1s). The paper, which was machine made off-white wove, came from R. D. Turner & Company of Roughway Mill, Malling, Kent in 480 set “mill” sheets (i.e. sheets to print 480 stamps) approximately 22×22 inches, in one ream (500 sheet) packets. Coloured paper was used for the 2 1/2d, 3d and 6d. New 320-set mill sheets had to be produced for the stamps printed in panes of 20. For the 1/2d, 1 1/2d, 2d, 2 1/2d, 3d, 5d, 6d and 1s, printing was set as two panes of 120, in ten horizontal rows of 12, one above the other with an exact one-stamp high unwatermarked and unprinted gutter in between rows 10 and 11 (fig.2). 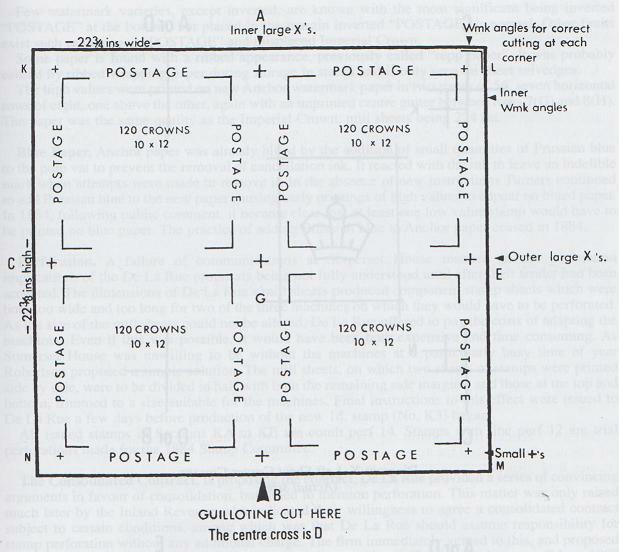 Around the Imperial Crown “bits” on the stamps, were other “bits” in the margins, which enables the left and right halves of the mill sheets to be recognised from most corner pieces. Fig. 3 shows the crosses on the left sheets and fig. 4 those on the right. They are mirror images of each other. Due to the mill sheets being cut down the middle, these watermark crosses are almost never seen complete. From 1892, letters in the watermark were introduced on the centre line below the top central cross between rows 11 and 12. Letters A to C were joined by D to F in 1896 with G coming later. They are rare. The 4d, 4 1/2d, 9d and 10d values were printed on the same paper but in 320 set (fig. 5), in 16 panes of 20. The same features, shown separately for clarity, are on both halves and all appropriate parts of the mill sheet. The dotted lines joining the watermark crosses show how sheets were cut before issue. Identification of the left and right sheets is the same as for the 480 sheets. The letters on the diagram on each pane are philatelic identifying letters. 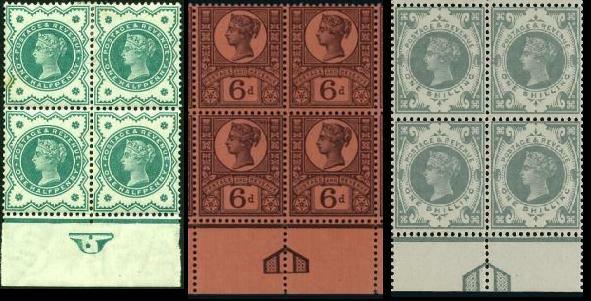 The 4 1/2d and particularly the 4d are very rare in complete sheets of 80. Bicoloured printing involved not only accurate perforation but also correct registration between the two colours. Plates were divided into fixed and moveable plates. Fixed plates printed the frame lines of the stamp and provided the register for perforation by correct positioning of the pinning points. 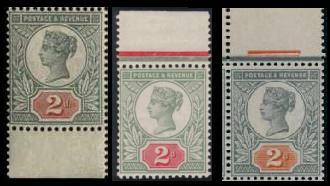 The two plates used to print the bicoloured stamp are referred to as head plates (featuring the portrait of the Queen) and duty plates (featuring the value). The 1s green and carmine is the exception as the value was printed on the same plate as the portrait, hence the fixed plate is referred to as the frame plate. On the head and frame plates, pinning points were created just like the ones used for the single coloured stamps. 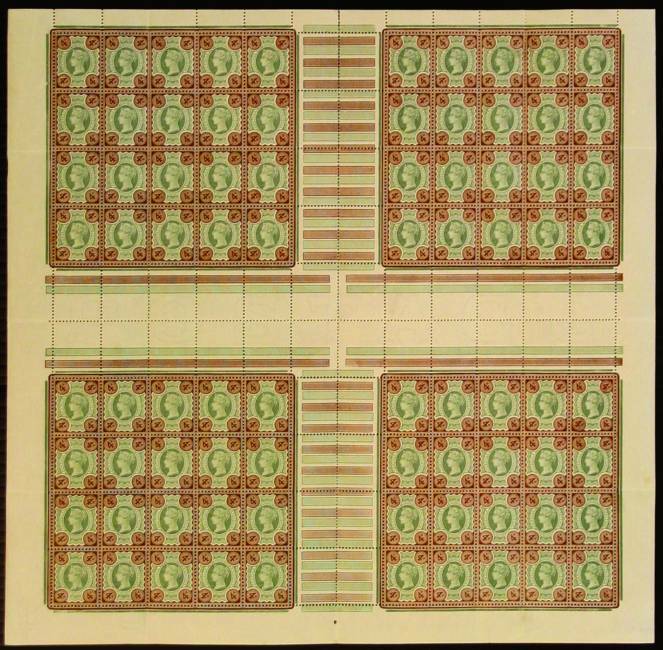 For the 4d, 4 1/2d, 9d and 10d the pinning points were dots top and bottom in duty plate colours on the centre line of the 160 set sheets. Since each pane was made separately from 20-set master plates, they were positioned by measurement when assembling a group of plates ready for printing. The movable plates could be adjusted to ensure proper colour registration across the sheets. Marginal rules, also commonly known ad “Jubilee” lines, were adopted in mid-1887 so that the first plates were constructed without them. 240-set duty plates were made with continuous rules round each pane. Before printing, the plates and rules were broken up to create movable units. Each value has different settings which vary dramatically in rarity (see examples). The 1/2d (both colours), 6d and 1s green each also had sheet dividing marks in the selvedge at the top and bottom (see examples). 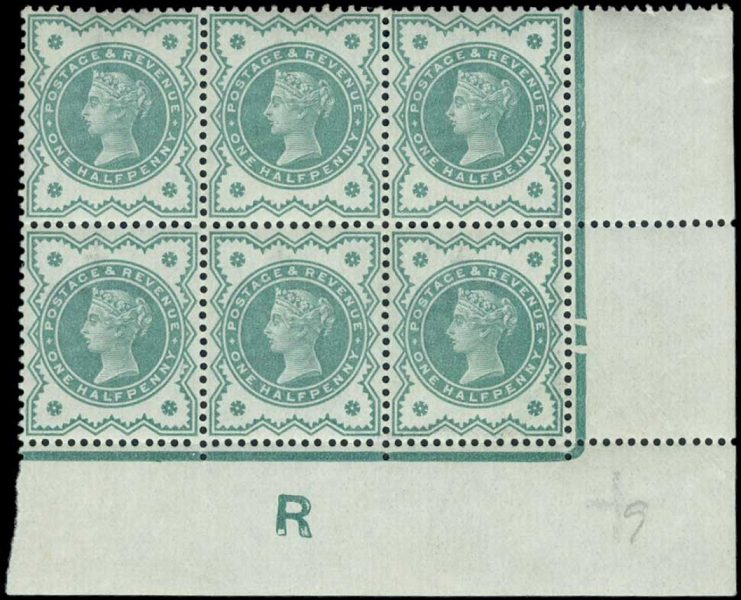 Both the 1/2d vermilion and 1/2d green had a control letter (from A to Q on the vermilion progressing in alphabetical order, and R on the green) printed below the 119th stamp in the sheet, which were used by De La Rue to maintain records of the use of the paper supplied for the printing of the stamps. Only the early printings of the vermilion were without control, and are these are the hardest to find (see examples). A failure of communications at Somerset House resulted in the perforation implications of the De La Rue proposals being not fully understood until after the tender had been accepted. 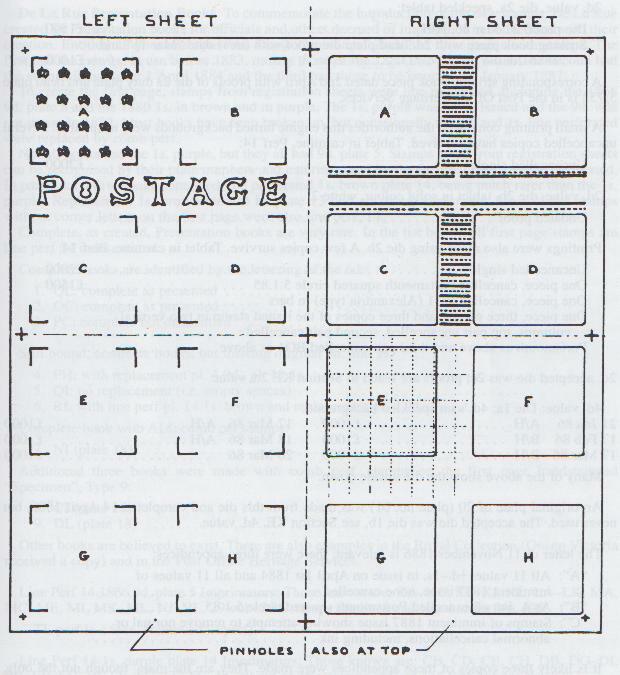 The dimensions of De La Rue’s mill sheets produced component stamp sheets which were both too wide and too long for two of the three machines on which they would have to be perforated. As the size of the mill sheets could not be altered, De La Rue offered to pay the costs of adapting the machines, but as the down-time to make these alterations would be too costly, Somerset House chose instead to divide the 480-set mill sheets in half, with the margins trimmed to a size more suitable for the machines. 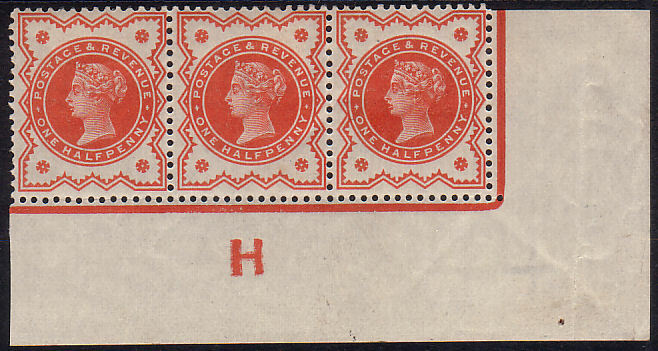 All 1887 Jubilee stamps are comb perforated guage 14. From 1884 De La Rue only used a horizontal comb perforator (see example), until 1898 when a vertical perforator was also introduced. The vertical perforator can be identified by a single extension hole below the bottom horizontal row (see example). The upper and lower sheet selvedge can be found perforated or imperforate from both peforating machines, and can affect the collectability of the control items. Head plate green is very fugitive to water, first turning blue then yellow. Stamps with signs of water damage are worthless. The purple is also easily damaged, and can be removed by chemicals. Duty or frame inks are fast in water. One of the three inks used for the 1900 1/2d was also highly sensitive to water leaving stamps in various shades of blue. All single coloured values were coloured values were printed direct onto 480-set mill sheets. The bicoloureds were first printed on half mill sheets (240 or 160-set) or smaller, but as printers became more proficient, they also were printed directed on to mill sheets.